Ghosts, a graphic novel I really like. I'm not a huge fan of graphic novels for myself. They don't work well with my reading style which is fast, with the words on the page rushing and racing into my brain as fast as I can turn the page. Graphic novels take me a much longer time to read as I have to examine the pictures and extrapolate from them as well as the brief text the personalities of the characters, the settings, the story. When words slide into my head they construct those facets swiftly and effortlessly. 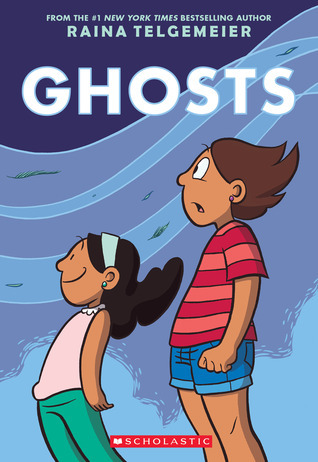 With a graphic novel I have to take into account the artist's vision and its a bit harder to become completely immersed..
That said, I loved Ghost by Raina Telgemeier. It is a terrific story of growing up, sibling relationships, facing hard realities, and dealing with the dead all in a book with a middle grade entry level. Because I was at ALA last month, and because I scored an advance reading copy, I've found all the adults I know who know graphic novels are thrilled about it. 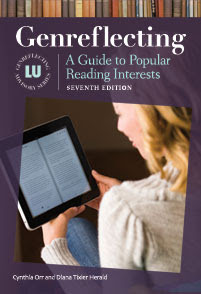 Even though middle grade kids are the intended audience, readers of all ages, teens and adults will also enjoy it. There is nothing I don't like about this book. The family and the conflict are real. I loved I could glean they were eating our favorite dessert without the text stating it. The themes of serious illness, death, and the lasting bonds of love were skillfully and thoughtfully handled. Definitely a book to put on your preorder list.